The Cross River branch of the Nigeria Medical Association (NMA) has called on the state government to declare a state of emergency on security in the state due to the kidnapping of its members. The NMA state Chairman, Dr Effiong Mkpanam and the Secretary, Dr Ikechukwu Ukweh said in a communiqué on Tuesday in Calabar that the incessant kidnap of its members was no longer acceptable. The call followed the recent kidnapping of Dr Usang Ekanem, a medical practitioner with the Cross River College of Education Medical Centre in Akamkpa Local Council of the state. Ekanem was kidnapped on Dec. 26, 2017 by unknown gunmen and released on Jan. 7. 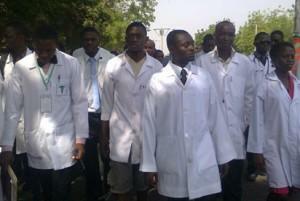 The abduction of Ekanem brought to five the number of medical doctors kidnapped so far. Similarly, three of the doctors’ family members were kidnapped in 2017. Before his release, the NMA had threatened to withdraw its services from the public, private, missionary and institutional hospitals in the state from Jan. 8. The association said the abductions of its members had instilled fear in the doctors and members of their families. “It is noteworthy that in 2017 within the state capital, five doctors and three of their family members were kidnapped at various locations. “We have noticed with utter dismay and drawn attention of the authorities to an upsurge in the cases of targeted kidnapping of medical practitioners. “We have also observed with dismay, a dangerous trend in which the security and lives of doctors is being threatened by some disgruntle members of the society. “We wish to remind the state government that it is her duty to provide adequate security for its citizens. The association threatened to withdraw it services without notice if the abductions continue. The post Kidnapping: NMA wants C/River Govt to declare state of emergency on security appeared first on Vanguard News.